It’s been nearly two years since I posted about The Spaceship, my standing desk built from IKEA shelving units. Since then, it’s been featured on sites like Lifehacker and IKEA Hackers, yielding unforeseen traffic to my humble blog. This gargantuan $250 dollar experiment has been replicated by at least 10 people I know of, each person modifying it to meet their own needs. When The Spaceship was first launched, I was working from home. Easy access to the keyboard was my foremost requirement. Second requirement was room underneath the front part of the desk to fit a high chair so that I could sit on occasion. Once I stopped working from home, I found the The Spaceship was seldom used. However, I was no longer burdened with the original requirements. 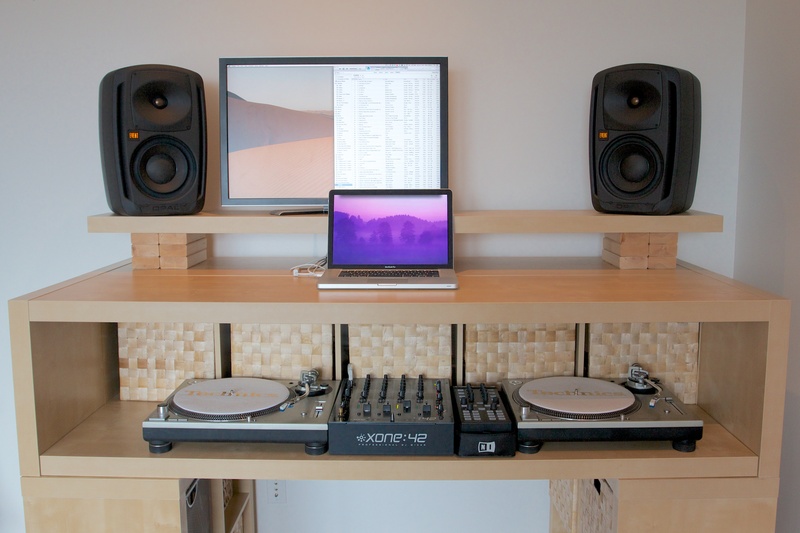 That allowed me to convert The Spaceship into a DJ booth AND a casual work station. The modification is simple and non-permanent. To drop the top, I unhinge and remove the partially constructed 5×1 Expidit shelf in the front. In its place lays the previously unused side of the 5×1 unit on top of the 2×2 units. I don’t bolt down the side of the 5×1 unit as the weight of the turntables and mixer is enough to secure it.When I need to get some work done, I simply put the partially assembled top back on. Since the top fits exactly over the shelf below, I don’t need to bolt it back on. Transitions take about 30 seconds. 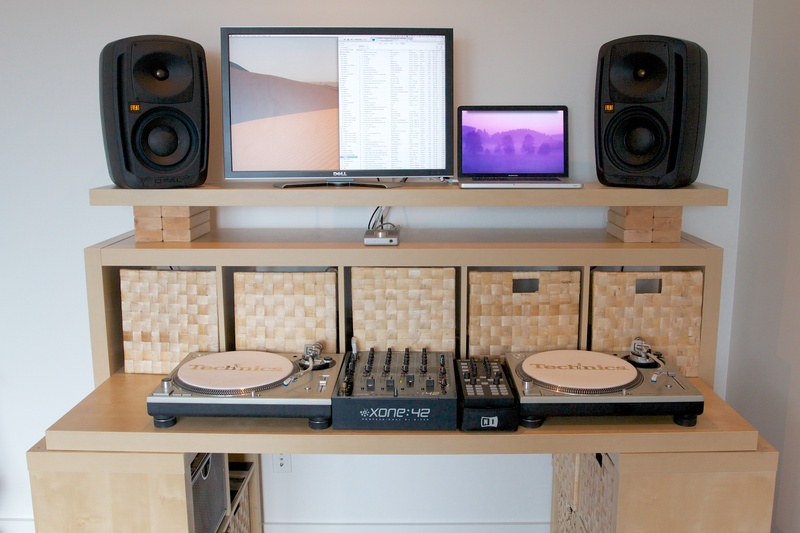 This unit makes for an ideal DJ setup. The speakers at ear level, equipment right at the waist height. 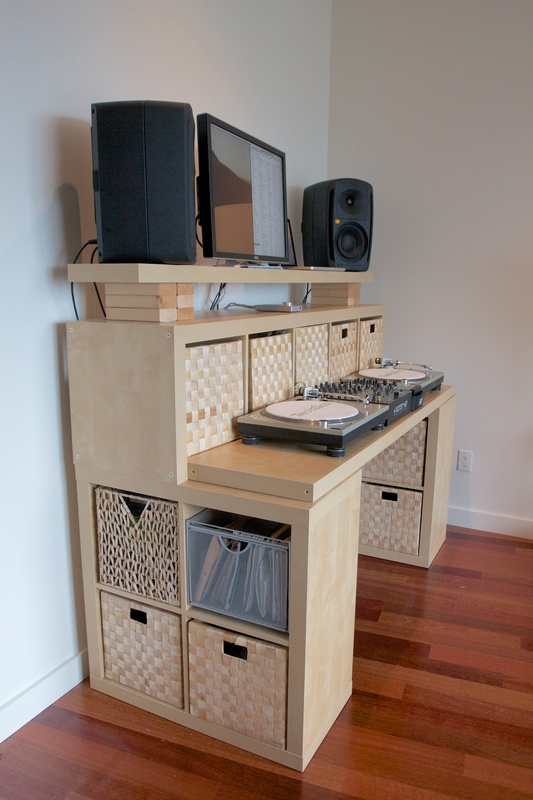 The Expedit shelf spaces measure 13″x13″, which is perfect for fitting 12″ records inside. Inside the assembled 1×5 unit lies a mess of equipment and wiring. I cover this mess with a disassembled Nasum basket, the same basket that I use for storage inside the 2×2 units. Sedentary work life? Can’t end well. Thinking forward with forward thinking, I constructed a walk/work apparatus using Peter’s Spaceship 2.0 design and a purpose-built walking treadmill. Wondrousness ensued. Now, I condense 12-16 hours of activity (4-8hr walk, 8hr work) into an 8 hour workday, pleasing the min-max brainmeats which command me. But something else happened. Something unexpected. I am easily twice as productive on this hawg. As I’ve learned, walking while working is more than time maximization. It adds imminence. If I stop walking, I will fall off the back of the treadmill. Mentally, this translates to “must… keep… going…” which bolsters intensity and productivity. At its core, what is walking? Moving forward toward a goal. Exactly what I do all day on the computer. Perhaps the mental/physical combination activates a primal goal-reaching adroitness. Perhaps that’s a stretch. Either way, the whole thing is made of win. Enough philosophy, let’s get down to gritty. In my version of Peter’s Spaceship 2.0, I decided on treadmill-matching black and to keep all shelves in tact. Skipping shelf modifications allows the ability to break down the beast into four movable modules. To prevent rubbing/scratching, I affixed the included fuzzy floor sliders to the underside contact points of the 5×1 shelves. Photos don’t properly portray the bootprint of this contraption. It’s massive, yet compact. Bulky but sleek. Truly, a luxury workspace for the power user. 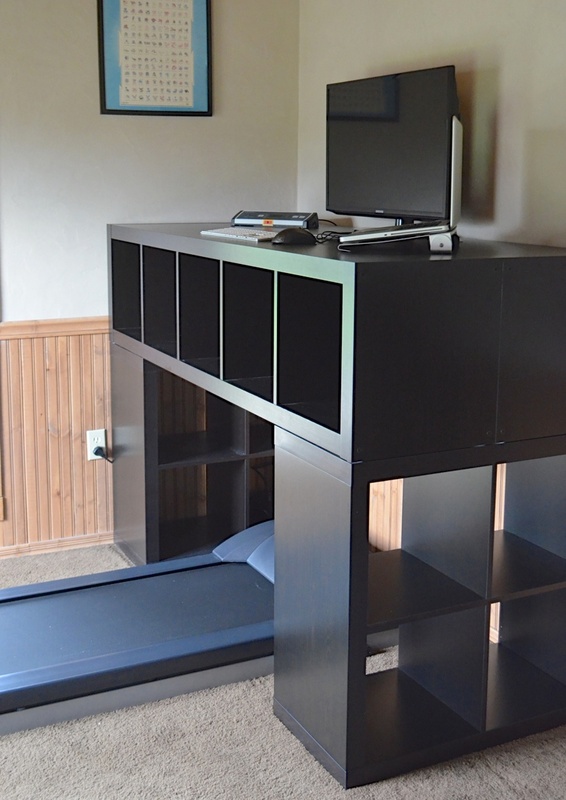 It affords ample surface, cubbies galore, and perfect height for a 5′ 11″ person. Lovingly, I coined her Behemoth, my voluminous, forboding iteration of Spaceship 2.0. 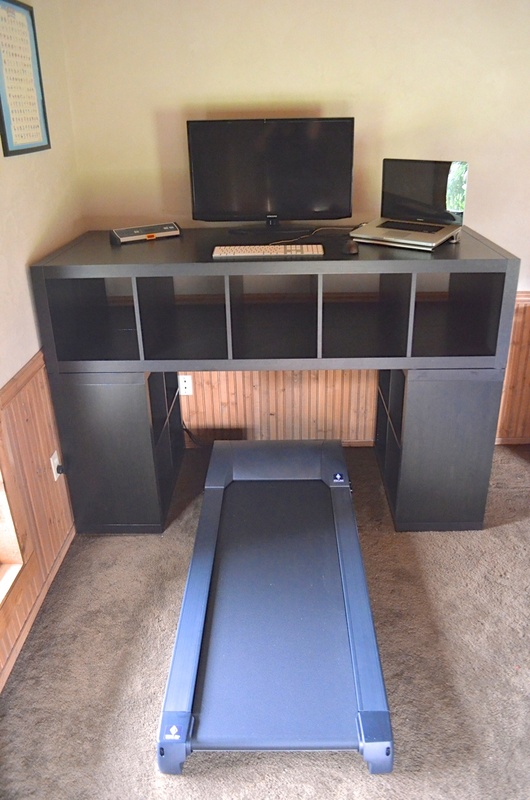 Put together, this particular desk/treadmill combo is quite the catch. Remember when tablets introduced untethered computing to the masses? This could be a similar breakthrough for power users where determination and $1200 nets a happy body and amped-up productivity. Okay, so I know I said at least 10 people I know of have modified The Spaceship to meet their own needs and that’s true. However, I only have full details from Chad. Email me details of how you modified The Spaceship and I’ll update this post! I love how you’ve been an inspiration for others! Such an impressive feat! Vive le spaceship!